Born and raised in the Bradner area of Abbotsford, Jean Martens played her first organized sport in Aldergrove at the age of 12 with the junior U21 softball league. She would go on to play fastpitch for 23 years. Martens coached minor girls fastpitch softball in Abbotsford for 15 years, as well as holding several executive positions with the Matsqui, Abbotsford & Sumas Minor Softball Association. 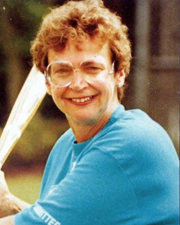 In 1979 Martens held the position of district minor coordinator for Softball BC, and this began a 25-year commitment to provincial body. Over those 25 years she held positions of minor director, senior director, slo-pitch director, second vice-president, president and past president. Martens represented Softball BC as a voting delegate to Softball Canada, serving on many national committees. While serving on a minor development committee, she wrote a playbook for Softball Canada which was distributed to all provinces and territories. In 1985, Martens had the pleasure of being the manager for the British Columbia women’s fast pitch team that competed in Saint John, New Brunswick at the Canada Summer Games. This was a highlight for Martens, who has enjoyed the merits of organized sport for a total of 50 years.